Good news everyone, the ASICS Gel Nimbus 20 is finally here. The Nimbus is the high cushioned shoe that provides runners with a highly comfortable ride during daily training. In the previous version, the Nimbus 19, we saw the added addition of FlyteFoam midsole. The Nimbus 20 also includes that same midsole with other minor tweaks to the shoe for a better fit. In the Nimbus 20 you are still going to get the same FluidRide FlyteFoam combination in the forefoot and heel area of the shoe. The combination of the two makes it great for shock absorption on those runs/walks on the pavement, and responsive enough for those quicker short or long runs. The strong durable rubber outsole also adds great traction for foot strike and toe off. One of the main updates to the shoe is the upper mesh. Now you may think that this shoe looks very similar to the previous version. But on last year’s model there was a noticeable flaw that could be felt often in the toe box, causing the shoe to feel short. Well, happy to say that it has been modified to fit more comfortably. The shoe uses more of a gradient mesh which allows the shoe to feel more open in certain areas. This also makes it more breathable. You will also notice that the lacing system will reduce pinching and irritation. As well, the heel has a bit more cushion and a snugger fit. 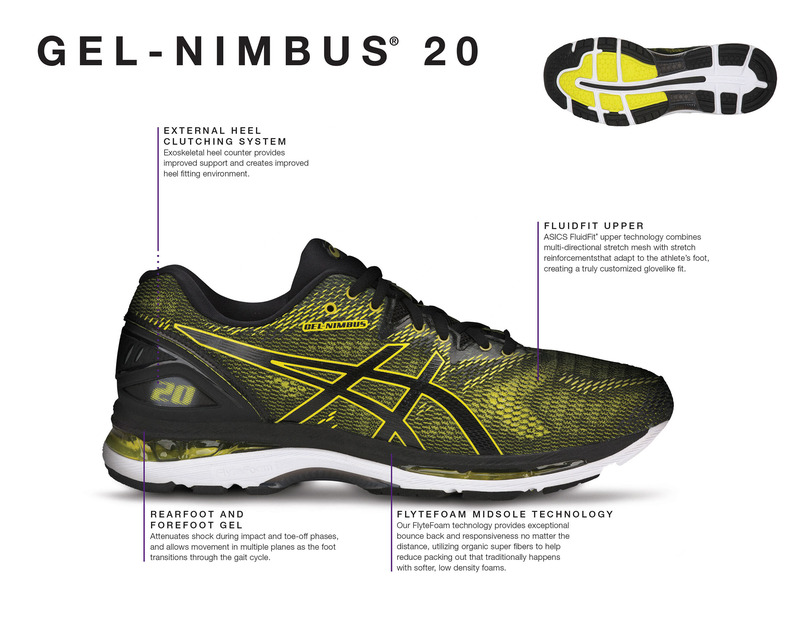 The Nimbus 20 is a comfortable neutral running shoe with lots of cushion. It is great for running longer distances on the road or trails and everyday use. With the added FlyteFoam cushion it gives the shoe a lighter and more responsive touch that runners most certainly crave. Do you think the ASICS Gel Nimbus 20 is for you? Come in and try one on, we’d like to hear what you have to say!